Ronald Reagan was inaugurated as the 40th President of the United States on January 20, 1981. This inauguration was the beginning of Reagan's eight years as President. George H. W. Bush was inaugurated as Vice President. 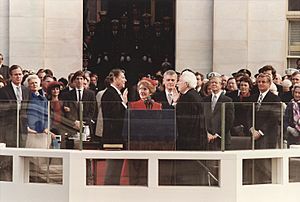 Reagan took the oath of office at the inauguration ceremony. Chief Justice Warren E. Burger gave the oath. On the same day, hostages from the Iran hostage crisis are released as Reagan is sworn in as President. First inauguration of Ronald Reagan Facts for Kids. Kiddle Encyclopedia.